Need a break from Pokemon GO? Don’t want to go outside in this miserable heat? Stay inside and beat the heat with Ghostbusters™: Slime City! Is there something strange in your neighborhood? Become a Ghostbuster and work your way through New York City blastin’ and baggin’ ghosts, goblins, and demons. I ain’t afraid of no ghost! 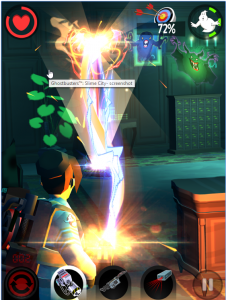 There is a lot going on here, you start out as a noob just trying to make it as a Ghostbuster. By taking jobs and fighting ghosts in the city you will earn money, gold and other cards that help you advance. This game is fun to play and is different enough from other games I have played on Android to make it fun. In this game, you get a pretty cool top down view of the city. Most of it is dark when you start but as you gain more jobs and complete them buildings start to light up with more to do at each one. Seeing the Stay Puft Marshmellow Man walking around Central Park is pretty cool. Watching the Ghostbuster car drive around from the top of the city is a neat little detail they added too. When you are taking down ghosts, the levels degrade when you shoot your blaster at objects other than the ghosts which make for a cool effect when you look around the level. I really like the animation and look of this game, it feels like I am playing a cartoon from the 80s or 90s which takes me back to when the original movies were out. Once you get to the higher levels of the game you even can join a Squad and play with others asynchronously. You get to build your own Proton Packs from all the different parts you win while blastin’ and baggin’, and can also level up your ghost hunting suit with the money and gold you win as well. Another neat detail is if something in the game is not ready for you to play there is a set alarm button on the screen that when tapped will send a push notification to your notification shade when it is ready, even when you are not actively playing the game. OK, so for all the good that you just heard, there is just as much bad about this game. The characters that we see ALOT of when jobs are over and we are in the city are absolutely terrible. The dialog they have between each other is campy and cheesy and since it is all text based can get lengthy when all I want to do is blast some ghosts. The worst part of this game is that there is so much going on and not a lot of explanation about what some things do or why they are popping up onto the screen. I found that I just assumed what certain things did (and maybe this is what they intended) like all the cards that you get at the end of battles or what a certain row of images are on the left side of the screen. 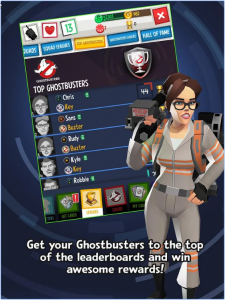 This is the official mobile game for the new Ghostbusters movie that released July 15th but I see no sign of any of the characters from the movie in this game. Just a weird observation I had, maybe. One more negative is the naggy buy stuff for real money screens that show up when you are looking for jobs as well as the product placement ads in the levels as you are playing the game. But the game is free so they have to make money somehow I guess. Who is this game for? If you play, Clash Royal, Pokemon Go and any other card based game that gives you things for battling other things, you will enjoy playing Ghostbusters™: Slime City! I have had fun with this game over the last week since I installed and I think you will too. Bustin will make you feel so good! 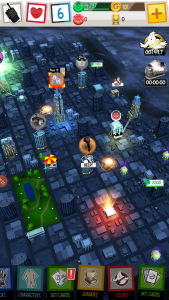 You can find Ghostbusters™: Slime City! In the Google Play Store for free with in-app purchases. This is a fun game, the graphics are cool and different. The music seems to consist of 1 song but that 1 song is great! WHO YOU GUNNA CALL! There is multiplayer mode here but it's not real time and takes to level 9 to unlock.